BASICSA HUMAN PERSPECTIVE Sally Ride, America’s first female astronaut, wrote the following after one of her trips into space: I also became an instant believer in plate tectonics; India really is crashing into Asia, and Saudi Arabia and Egypt really are pulling apart, making the Red Sea even wider. Even though their respective motion is really no more than mere inches a year, the view from overhead makes the theory come alive. From space, Ride was seeing evidence of the internal forces that have shaped the earth’s surface. The internal forces that shape the earth’s surface begin beneath the lithosphere. Rock in the asthenosphere is hot enough to flow slowly. Heated rock rises, moves up toward the lithosphere, cools, and circulates downward. Riding above this circulation system are the tectonic plates, enormous moving pieces of the earth’s lithosphere. You can see the position of the tectonic plates in the map below. Geographers study the movement of the plates and the changes they cause in order to understand how the earth is continually being reshaped—and how earthquakes and volcanoes occur. sliding past each other in a shearing motion. The diagrams below show details about plate movement. 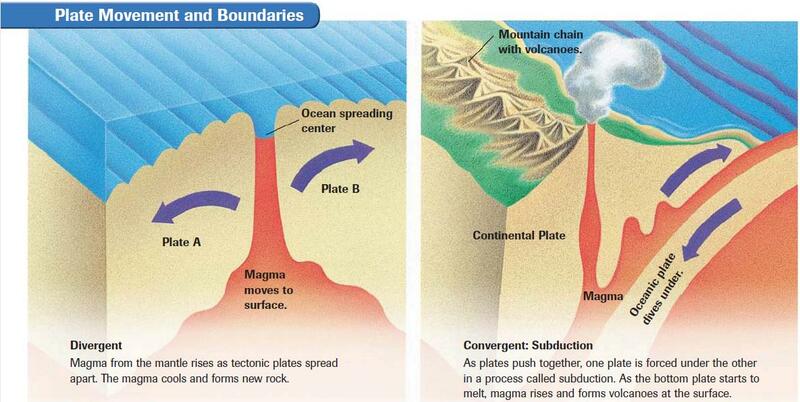 Divergent boundary—Plates move apart, spreading horizontally. Convergent boundary—Plates collide, causing either one plate to dive under the other or the edges of both plates to crumple. Transform boundary—Plates slide past one another. An example of a divergent boundary is the one between Saudi Arabia and Egypt. The two plates on which those countries sit are spreading apart, making the Red Sea even wider. The Red Sea is actually a part of the Great Rift Valley in Africa. If you look at the map of Africa on page A18, you will see a string of lakes along the eastern side of Africa, including Lake Tanganyika and Lake Nyasa. These lakes, along with the Red Sea, were formed in the spreading boundary. An example of a convergent boundary can be found in South Asia. The plate where India is located is crashing into the Asian continent and building up the Himalayas. 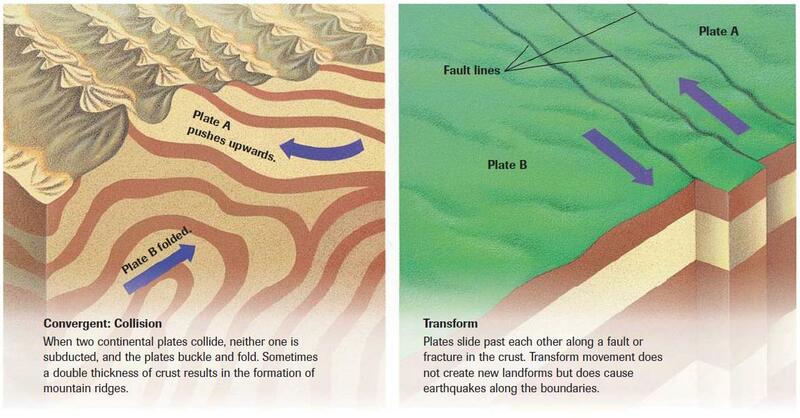 One of the most famous examples of a transform boundary is in North America—the San Andreas Fault in California. Study the diagrams below to understand the movement of the plates and their effect on the surface of the earth. When two plates meet each other, they can cause folding and cracking of the rock. The transformation of the crust by folding or cracking occurs very slowly, often only a few centimeters or inches in a year. Because the movement is slow, the rocks, which are under great pressure, become more flexible and bend or fold, creating changes in the crust. However, sometimes the rock is not flexible and will crack under the pressures exerted by the plate movement. This fracture in the earth’s crust is called a fault. It is at the fault line that the plates move past each other. As the plates grind or slip past each other at a fault, the earth shakes or trembles. This sometimes violent movement of the earth is an earthquake. Thousands of earthquakes occur every year, but most are so slight that people cannot feel them. Only a special device called a seismograph can detect them. A seismograph measures the size of the waves created by an earthquake. The location in the earth where an earthquake begins is called the focus. The point directly above the focus on the earth’s surface is the epicenter. The map on page 37 outlines the major plate boundaries. Nearly 95 percent of all recorded earthquakes occur around those boundaries. Plate movement along the Pacific Rim and from southern Asia westward to southern Europe makes this region especially vulnerable to quakes. Earthquakes result in squeezing, stretching, and shearing motions of the earth’s crust that damage land and structures. The changes are most noticeable in places where people live. Landslides, displacement of land, fires (from broken gas lines), and collapsed buildings are major outcomes of the ground motion. Aftershocks, or smaller-magnitude quakes, may occur after an initial shock and can sometimes continue for days afterward. An earthquake is the sudden release of energy in the form of motion. C.F. Richter developed a scale to measure the amount of energy released. The Richter Scale uses information collected by seismographs to determine the relative strength of an earthquake. The scale has no absolute upper limit. Most people would not notice a quake that measured 2 on the scale. A 4.5 quake will probably be reported in the news. A major quake has a measurement of 7 or more. The largest quake ever measured was 8.9 in the Kermadec Islands of the South Pacific in 1986. TSUNAMI Sometimes an earthquake causes a tsunami (tsu•NAH•mee), a giant wave in the ocean. A tsunami can travel from the epicenter of a quake at speeds of up to 450 miles per hour, producing waves of 50 to 100 feet or higher. Tsunamis may travel across wide stretches of the ocean and do damage on distant shores. For example, in 1960 a quake near Chile created a tsunami that caused damage in Japan, almost half a world away. In December 2004, a tsunami from a quake in the Indian Ocean struck areas of Southeast Asia, South Asia, and East Africa. An estimated 225,000 people were immediately killed, and another 1.2 million were forced to leave their homes. Volcanoes are among the most spectacular of natural events. Magma, gases, and water from the lower part of the crust or the mantle collect in underground chambers. Eventually the materials pour out of a crack in the earth’s surface called a volcano. Most volcanoes are found along the tectonic plate boundaries. When the magma flows out onto the land slowly, it may spread across an area and cool. Magma that has reached the earth’s surface is called lava. The most dramatic volcanic action is an eruption, in which hot lava, gases, ash, dust, and rocks explode out of vents in the earth’s crust. Often a hill or a mountain is created by lava. The landform may also be called a volcano. Volcanoes do not erupt on a predictable schedule; they may be active over many years and then stop. Sometimes they remain inactive for long periods of time—as long as hundreds of years— before becoming active again. 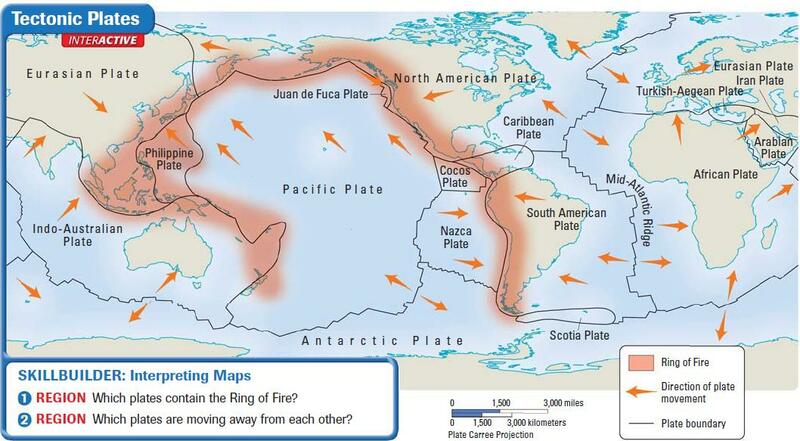 The Ring of Fire, a zone around the rim of the Pacific Ocean, is the location of the vast majority of active volcanoes. Eight major tectonic plates meet in this zone. Volcanic action and earthquakes occur frequently there. Other volcanoes are located far from the margins of tectonic plates. They appear over “hot spots” where magma from deep in the mantle rises and melts through the lithosphere, as in volcanoes in the Hawaiian Islands. Hot springs and geysers are indicators of high temperatures in the earth’s crust. Hot springs occur when ground water circulates near a magma chamber. The water heats up and rises to the surface. The hot springs and pools of Yellowstone Park are examples of this type of activity. A geyser is a hot spring that occasionally erupts with steam jets and boiling water. Old Faithful, a geyser in Yellowstone, erupts regularly, but most geysers are irregular in their eruptions. Countries with hot springs and geysers include the United States, Iceland, and Japan. Not all volcanic action is bad. Volcanic ash produces fertile soil. In some parts of the world, the hot springs, steam, and heat generated by the magma are tapped for energy. In Iceland, for example, volcanic heat and steam are used for heating and hot water in the city of Reykjavik. Internal forces have a major role in shaping the earth. In the next section, you will learn how external forces also change the landscape.